Equipment Protection Systems are part of modern beamline design. They monitor the status of specific elements and can take action to avoid damage in certain limits are reached. The user can check the EPS status via a software window or a control panel. The Equipment Protection Systems are integrated with Personnel Protection Systems, to ensure fail safe operation of the beamline. 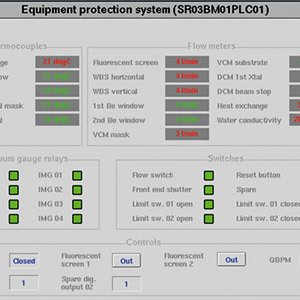 The EPS is PLC based but can be interfaced with an enunciator panel, as shown below, to give a fast visual overview of the beamline status and any fault condition.